South Korean electronics giant Samsung has introduced Orion, a new 1 GHz Cortex A9 processor designed for use in low-power, high-performance mobile devices like tablets, netbooks, and smartphones—and, unlike mobile chips currently driving things like the iPad and Samsung’s own Galaxy S devices, the new A9-based chip sports a pair of processing cores running at 1 GHz. Built on a 45-nm process, the new dual-core Orion chip also supports 1080p high-definition video playback at 30 frames per second, and Samsung claims, when using an enhanced GPU, the chip is capable of delivering five times the 3D graphics performance of existing Samsung processors—which means it’s potentially ideal for mobile media and gaming. The chip also features an onboard triple display controller architecture, which means that the chip can push graphics to two screens (say, panels on a clamshell tablet device) as well as push video to an external display or HDTV. 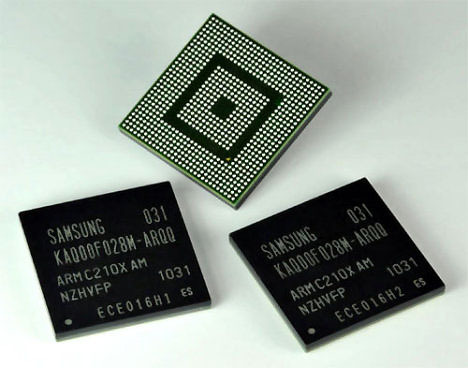 Samsung has also built a GPS baseband processor into the Orion chip for easy support of location-based services, and the chip supports interfaces for NAND, moviNAND, SSD, or hard drive storage using either eMMC or SATA interfaces. Samsung says it expects to begin shipping the Orion chip to “select customers” in the fourth quarter of 2010, with mass production scheduled to start in the first half of 2011.